I probably shouldn't say this but then again I'm Joe Biden.... The way things have gotten today- and I'm not singling out any party or group of people, just the politics, the culture- it is, uh, it's become too personal., too corrosive.... You folks, the Democratic/Republican governors are the best hope we have where for bringing back an atmosphere we can disagree without being disagreeable...where we can have significant ideological differences but at the end of the day it's all about finding a solution. Bipartisanship may be the norm at NGA gatherings but is rejected by GOP governors as well as their members of the House and Senate. 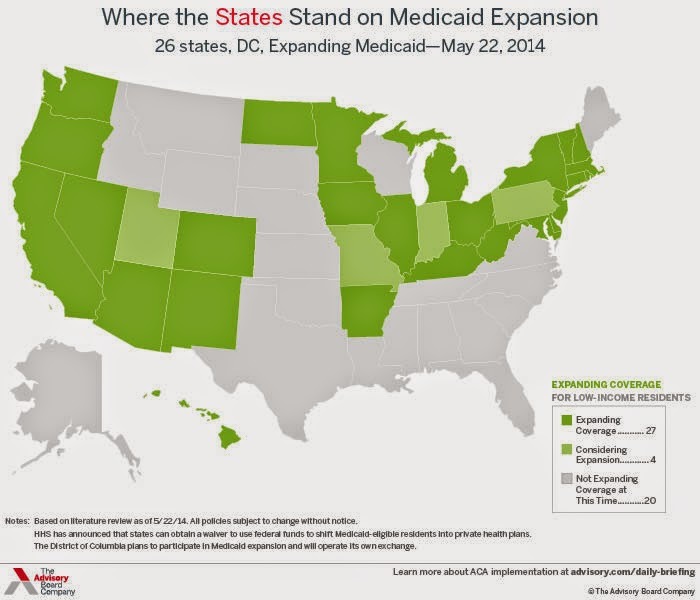 Of the 21 states which have rejected free money- AKA medicaid expansion- wherein the federal government would pay 100% of the cost for three years and 90% thereafter to increase health coverage of poor people, 18 have Repub governors. The other three- Missouri, Montana, and Virginia- have state legislatures controlled by the GOP (map, below, from The Advisory Board Company). Biden is only following the lead of President Obama and former Senator Clinton, both of whom have expressed similar bipartisan sentiments, and in venues in which it is completely optional. Fortunately, a member of the Obama Administration has chosen to be forthright and, not surprisingly, he's someone not running for anything. Attorney General Eric Holder. Criticizing House Speaker Boehner's move to sue the President and Sarah Palin's call for impeachment of Obama, stated on ABC's "This Week"
For whatever reason, [some] Republicans decided early on that this was a president they were just simply not going to cooperate with. And over the past five-and-a-half years, we have seen demonstrations of that, where the president has reached out his hand, offered compromises that have simply not been met [in the way] they have been in the past by a Republican Party willing to do the appropriate things. As Charles Pierce has written, "We allow ourselves only two major political parties. One of them is completely out of its fcking mind. This is a national problem." It may no longer matter whether its leaders are sincere or insincere, catering to tea party conservatives, playing a good cop, bad cop routine, or merely having fun at the nation's expense.